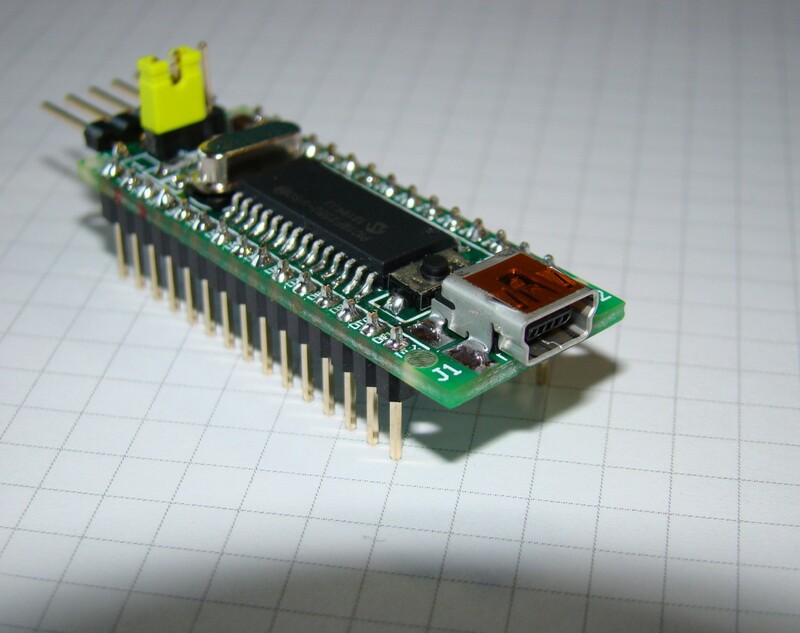 – It has a full speed 2.0 USB internal module, so you don’t need external transceivers to have a USB interface. – Power supply starts at 2V, so it’s perfect for a battery powered systems. The main part of the board. 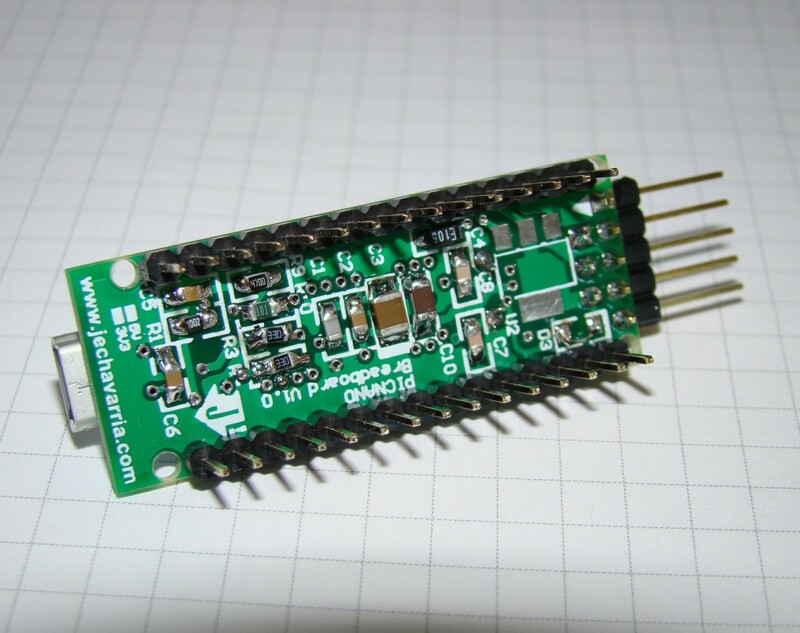 It has the basic elements to work with the PIC without external componentes: decoupling capacitors, reset pushbutton, mini-USB connector and external oscillator. And, obviously, the PIC18F2550 microcontroller in 28-pin SOIC package. 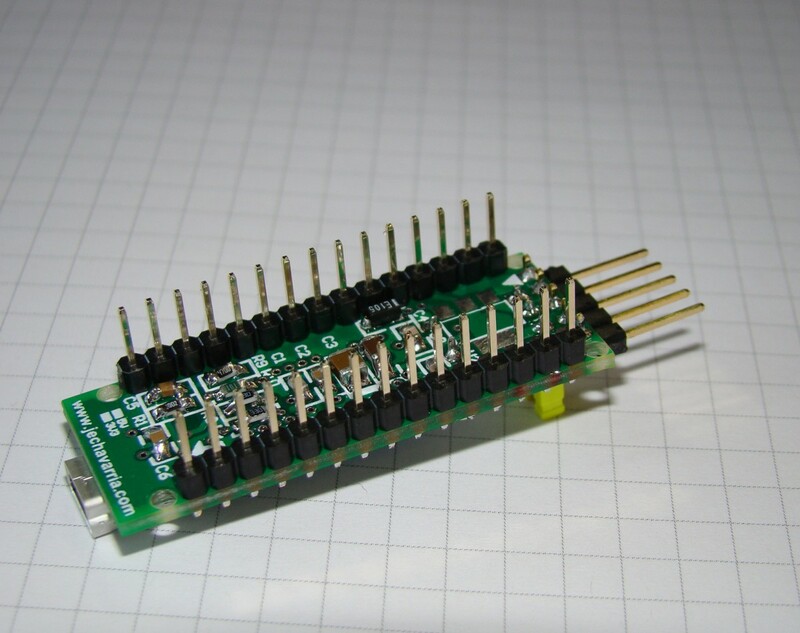 The board has two 15-pin connectors, J1 and J2. The space between pins in each connector is a standard 0.100 inches. The distance between both connectors are 0.600 inches. 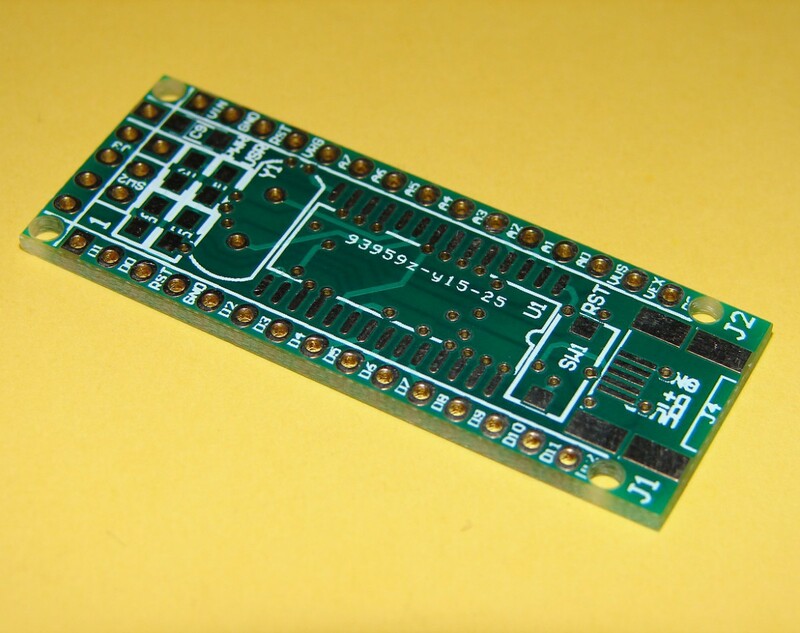 This allows to use the board in a bread board for fast prototyping. 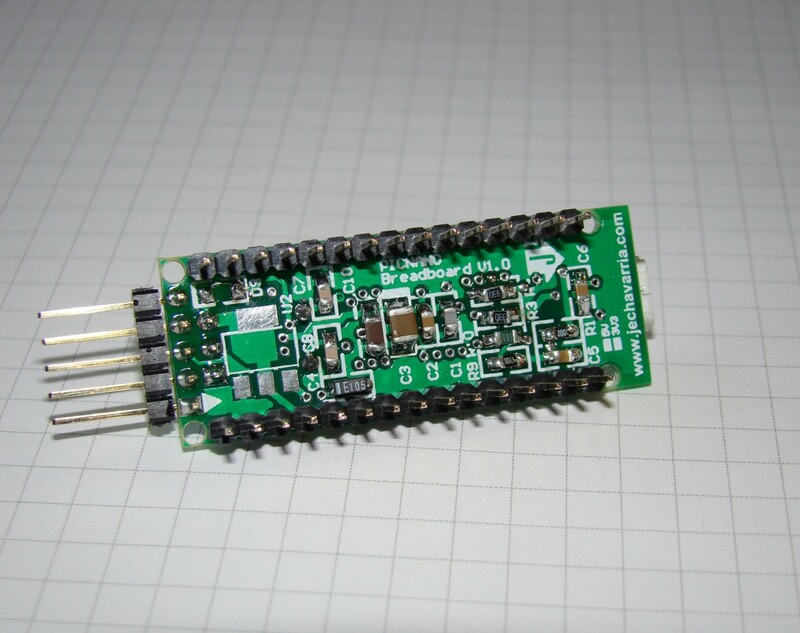 Most of the signals are compatible with the Arduino Nano pinout. Main differences are on pins 13, 14 and 15 of J2. 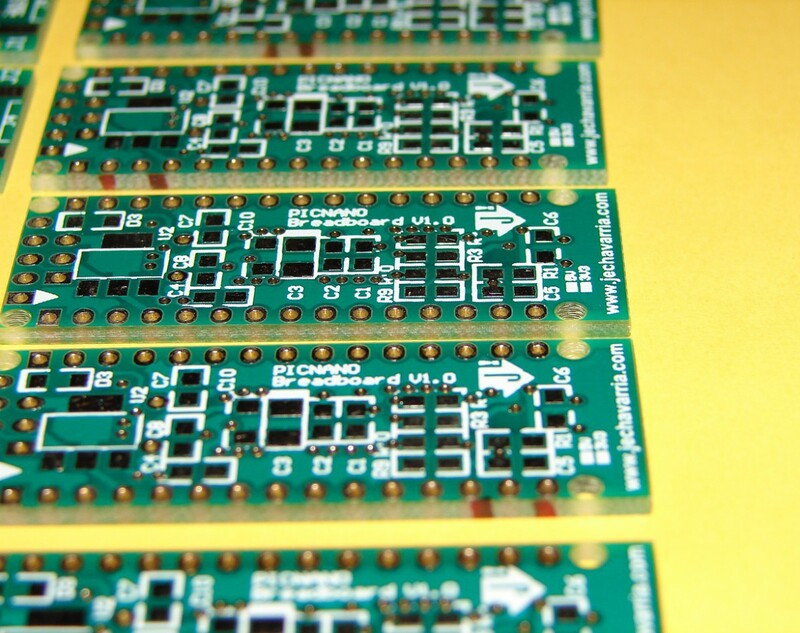 In the PICnano board, in these pins are the VUSB and VCC_EXT power supplies. 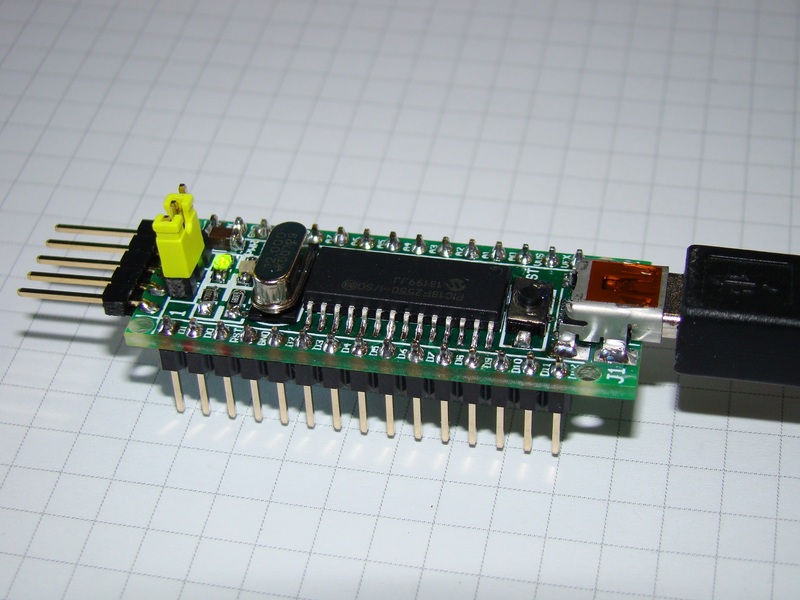 – From VCC_EXT pin (J2, pin 14). 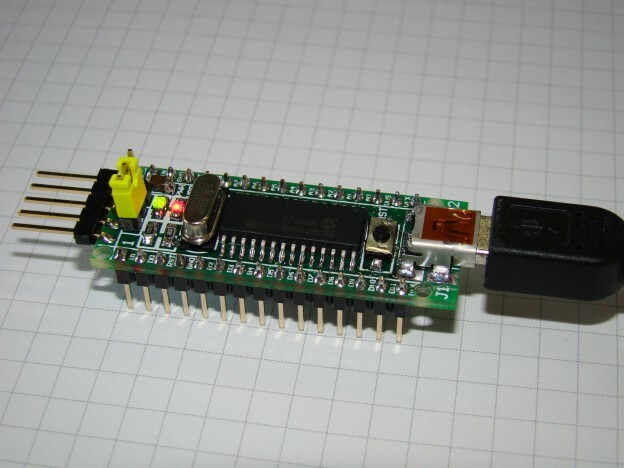 In this case, the microcontroller power supply is the same that you apply on this pin. The limits are the same of the microcontroller operating voltage (2V to 5.5V), and you can use it to power the board from a Li-ion battery dicrectly. BE CAREFULLY when you use this power supply, you acts directly on the microcontroller VDD pins!! – From an external USB port (VCC_USB). 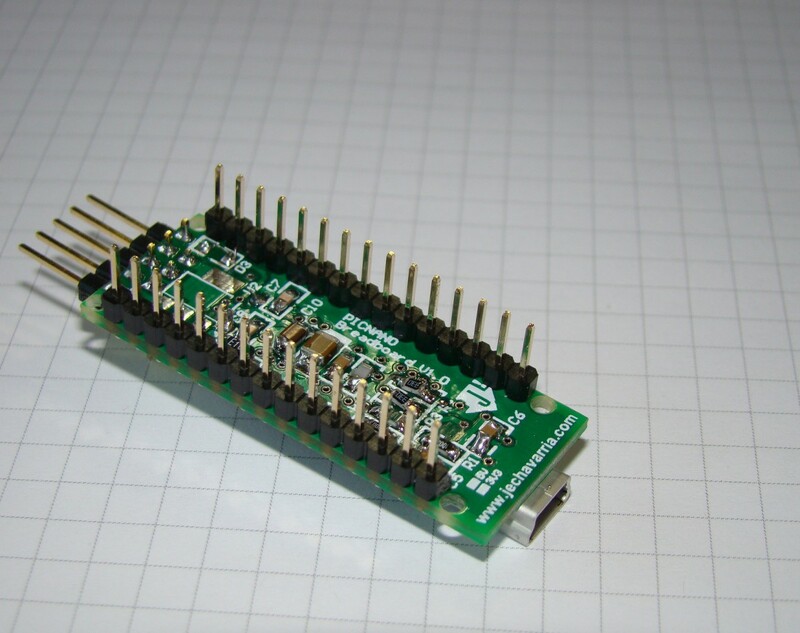 – From an external VIN power supply (J2, pin 1). 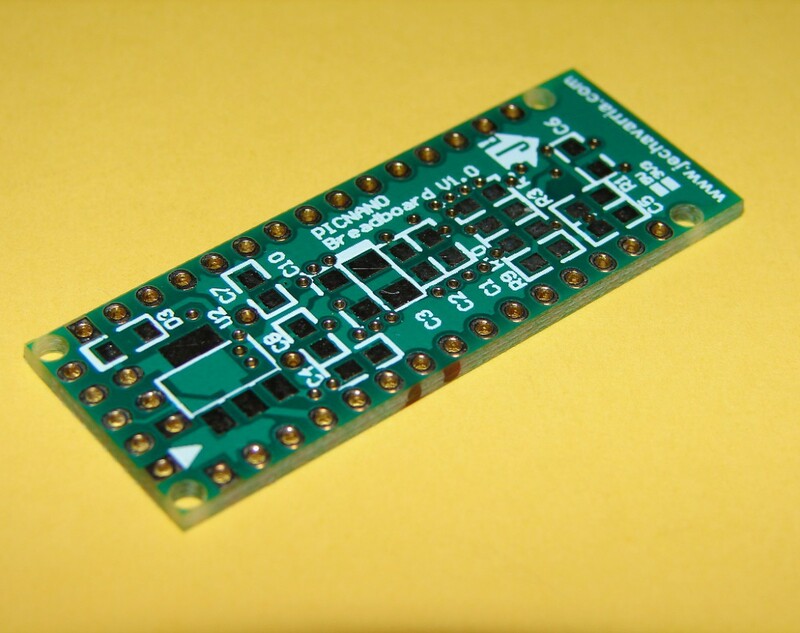 The board is ready to mount a linear LDO regulator (NCP1117), like the Arduino Nano board. In this case, the maximum imput voltage is 20V. The NCP1117 has many different output voltages, so you can select the right one according your application (1.5 V, 1.8 V, 2.0 V, 2.5 V, 2.85 V, 3.3 V, 5.0 V). With the jumper in the left position (seeing from the USB connector), the power supply can be from USB or external VIN. On the right position, the power supply is VCC_EXT, directly to the microcontroller power pin. 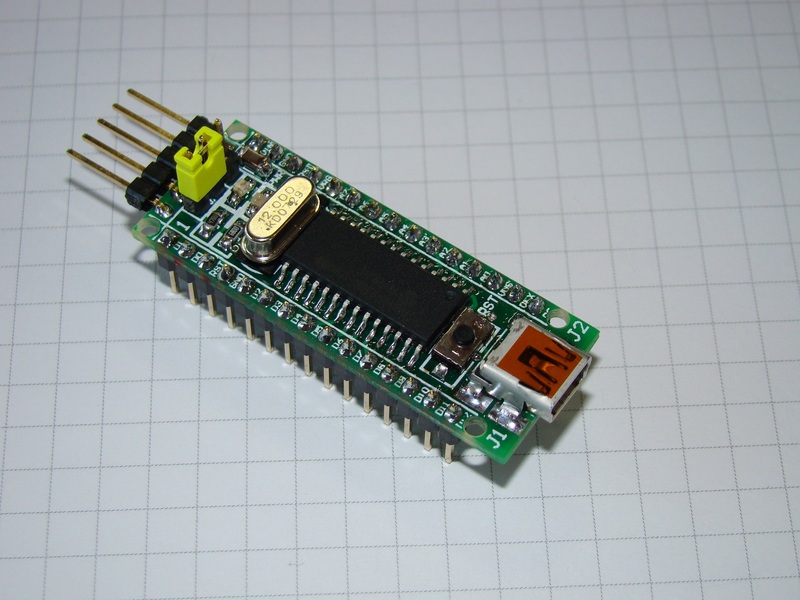 The standard connector from Microchip to program their devices. I use the Pickit3 tool, that also allows debbug the code with the MPLAB environment. This connector is the one you can see behind the jumper. A general purpose red led on the UART TxD pin. It’s usefull to start working with the board or for developing the application. To test the board and validate both the design and the mounting, I make a small program to flash the red led (the classic ‘Hello World’ with leds!!). I use the Mikro C PRO compiler, from MikroElektronika. I like this compiler because offers a lot of libraries with samples and code ready to use. 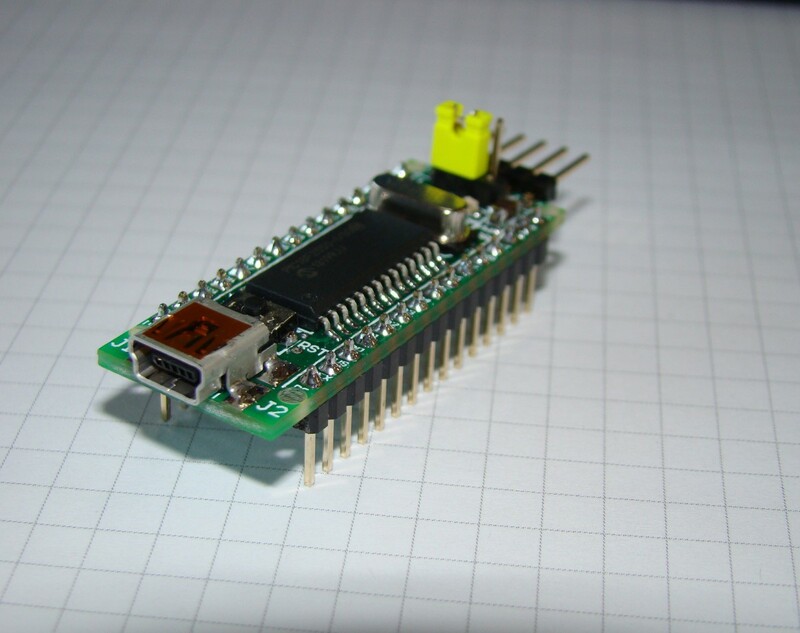 Also, they’ve got a bootloader for this microcontroller (you can download here). So, you can burn the PIC once with the bootload code (using a programming tool) and after you can upload your code to the PIC with a PC tool, eliminating the need of an external programmer! If you’re interested, here you can download the full project, including the source file, *.hex and config settings: PICNANO_HELLO_WORLD. 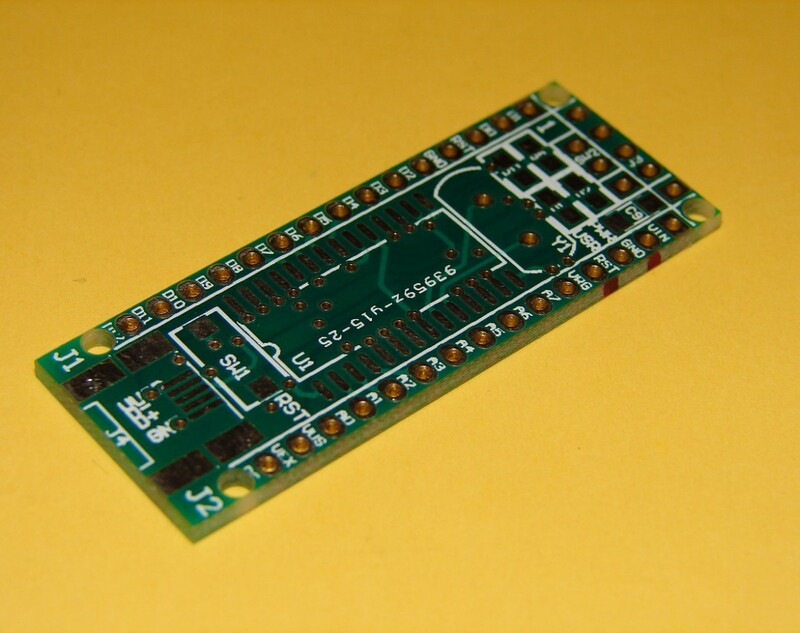 Finally, on the Embedded-Lab blog you can find a great article of how to getting started with the PIC18F2550 microcontroller. i teach a stem club at local middle school. 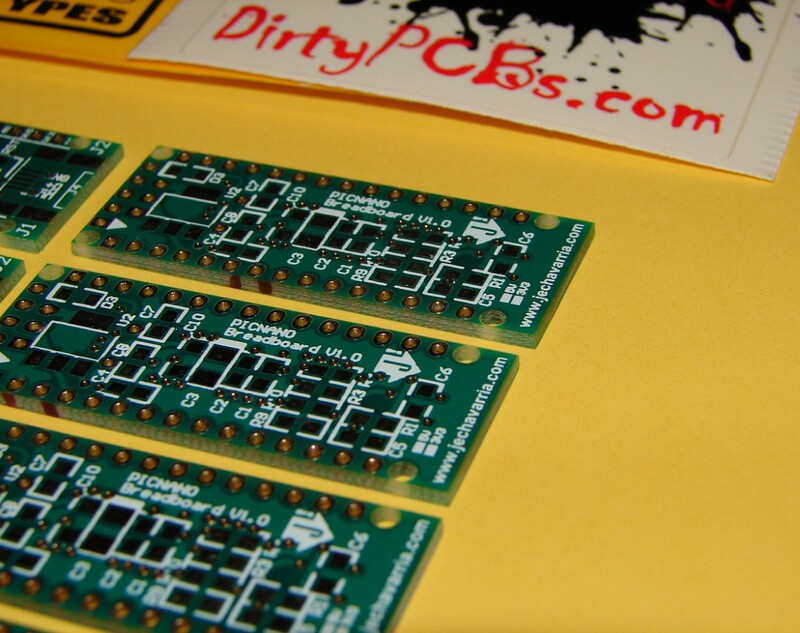 We have a pic kit 3 and I have a couple samples of and 18f2550 left over from an it toy free pcb. 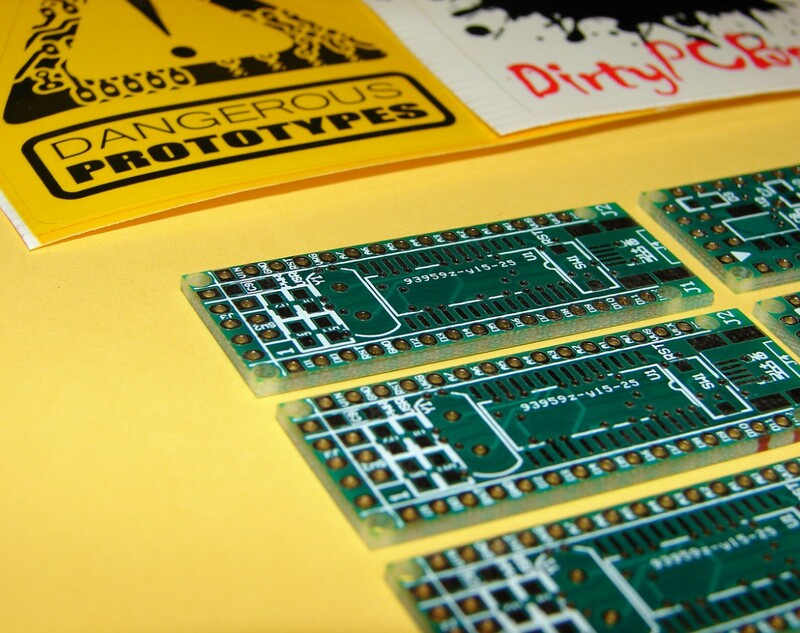 Do you have an extra pcb you could share with us for an educational project? Thanks for read the blog and your interest in the board! Unfortunately I’ve all the boards mounted (except oscillator and LDO), so I can’t send you one blank. 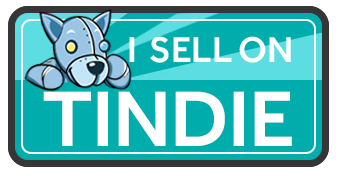 If you’re interested in one populated, please tell me. Also, you’ve the gerber files in the webpage to manufacture it. If you’re interested in a new fabrication, maybe we can do it together? I am interested in one populated. I was trying to keep costs down. Would you be able to share one with our club? shipped to US? 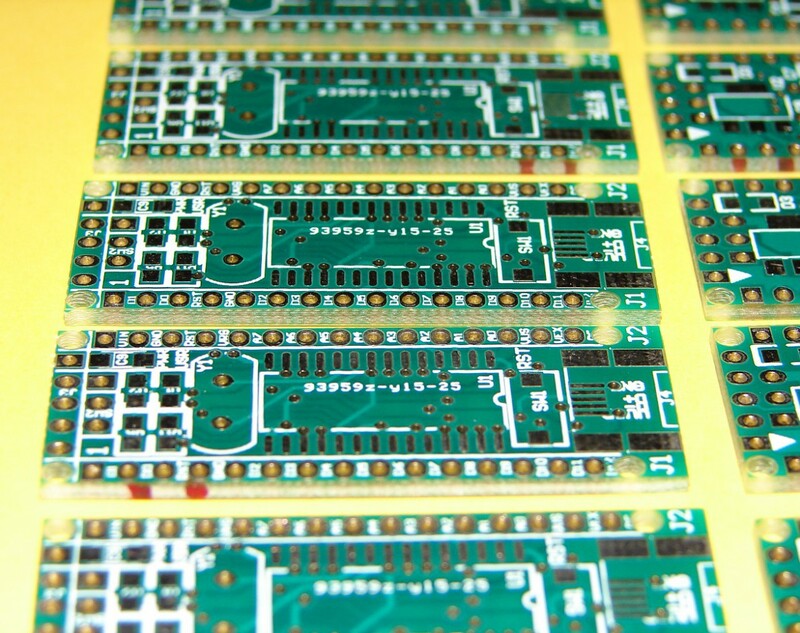 might be cheaper to fab a pcb domestically. thank you! Thanks for read the blog and your interest in the board! Also, thanks to upload to Oshpark! I just update the post with the BOM, I hope this will enough for you and can assemble it. Any questions or doubts, please contact with me. Also, when you finish the building, can you send me a photo? Lovely site, it loads genuinely quick and appears really awesome. First of all, thanks for read the blog and your interest in the board! I just check the datasheet of both microcontrollers, and the differences are mainly in the memory (both FLASH and RAM) and in the internal oscillator. 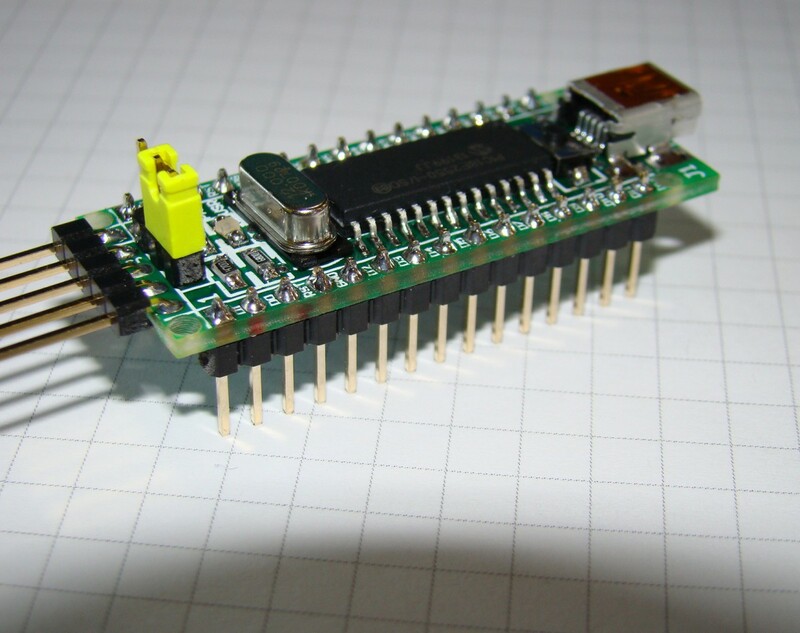 The footprint are the same, so you can use the PICnano breadboard to mount the PIC18F2450 wuithout mods. About the memory, the PIC18F2450 has less Flash (16 kb Flash instead of 32K) and RAM (768 bytes instead of 2048). About the internal oscillator, with the PIC18F2550 you can run up to 8MHz, while using the PIC18F2450 you only can run up to 32 khz. Having this differences in mind, you’ll not have any trouble for porting the code. I hope the answer clears your question, if you have any other question or doubt, please contact with me!! 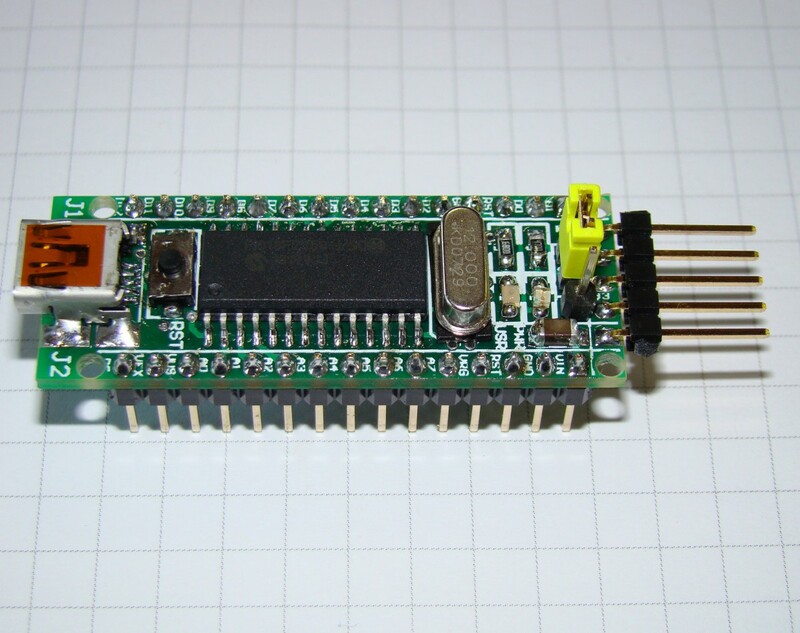 There are other options to achieve the USB module clock requirement and still provide flexibility for clocking the rest of the device from the primary oscillator source.